You'll be £10.99 closer to your next £10.00 credit when you purchase The Great War. What's this? Revered as the epitome of German militarism and moral decency, Field Marshal Paul von Hindenburg was one of the most popular and dominant figures of the Great War and of 20th - century Germany. Alongside Erich Ludendorff he secured a crucial victory over the Russians at Tannenberg before finding fame through a number of significant victories such as the Battle of the Masurian Lakes. Many argue that beneath his powerful facade was a weak-willed man who relied heavily on the advice of others to make decisions. Nevertheless he became a cult figure in Germany and wooden statues of him were built all over the country, onto which people nailed money and cheques for war bonds. After the war ended, von Hindenburg was persuaded to run for the office of President and, thanks to his war hero status, was elected in 1925. He remained in office until his death in August 1934. His memoirs, written in the immediate aftermath of the German defeat in 1918, provide compelling insights into German strategy and are essential reading for anyone interested in the First World War. This edition has been abridged and includes a new introduction by the renowned historian, Charles Messenger. This volume is an abridged version of Hindenburg’s memoir ‘Out of My Life’, first published in 1920... The memoir helps to understand the strategic decisions that were taken during the war, and Hindenburg’s frustration of the continued war on the western front at the expense of a decisive breakthrough in the east. A) The author is none other than the chief of general staff of the German army. The firsthand information he makes available and his views on the different matters are invaluable to the understanding of the Great War but also mainly to the understanding of the author himself. 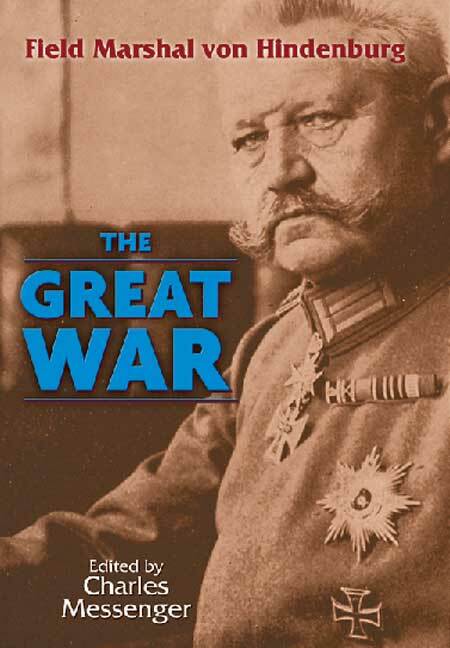 B) The book discusses the strategic decisions taken by the German General Staff in the Great War in an academic style. C) The book was written in the immediate aftermath of the Great War and is therefore a faithful reproduction without hindsight bias or other judgment errors.
. . . an important read for anyone interested in the 1914–1918 war. PAUL VON HINDENBURG (1847–1934), the son of Prussian aristocrats, joined the army in 1865 and served at the Battle of Königgrätz and in the Franco-Prussian War. Recalled out of retirement in 1914 he went on to become a much revered hero of the Great War. After the war he served as the President of Germany until his death in 1934.